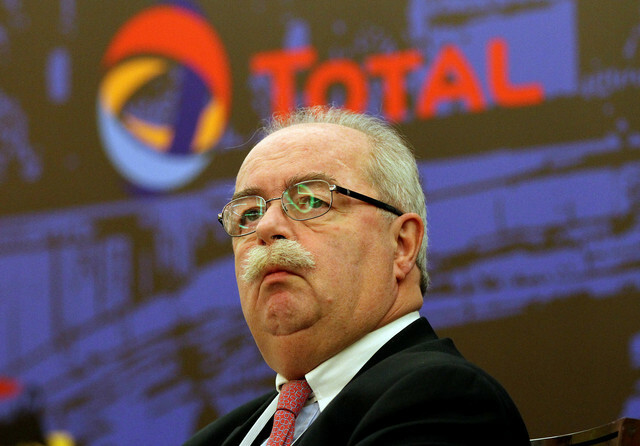 An ominous Federal Security Service (FSB) bulletin issued to all Ministries within the past hour has ordered that all information relating to the crash of the Dassault Falcon 50 business jet at Vnukovo International Airport (VKO) that killed Christophe de Margerie [photo top left], CEO of French oil giant Total [the world's 13th biggest oil producer and Europe's 2nd largest], earlier today has now been classified as Of Special Importance, which is the highest classification level and refers to information which, if released, would cause damage to the entire Russian Federation. 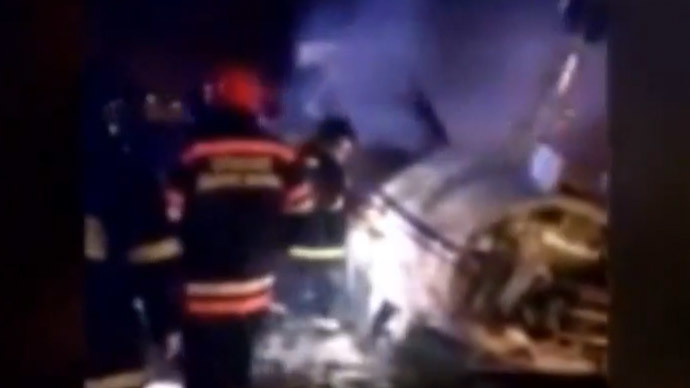 According to this bulletin, the preliminary FSB investigation into this crash [photo 2nd left] showed that upon takeoff at 12:10am Moscow time the plane's nose landing gear collided with a snow-removing machine and rolled over causing a fire that broke out after the collision, but there was no explosion, and which was quickly extinguished by the services of the airport. The FSB further confirmed that Christophe de Margerie was the only passenger of the jet and died along with the airplane's crew in the collision. His death was further confirmed by Total and the head of the Vnukovo International Airport press service. Of the different versions of the accident currently being publicly investigated, the FSB says, are the guilt of pilots, guilt of dispatchers, guilt of the snow-removing machine's driver and poor visibility. To the “actions and motivations” of “state-actors” [FSB euphemism for the Central Intelligence Agency (CIA)] in seeking to assassinate Christophe de Margerie, this bulletin says, was the meeting he had just concluded with Prime Minister Dmitry Medvedev wherein Total and its partner, Russia’s largest independent oil and gas producer Novatek, would begin selling oil and liquid natural gas (LNG) in either Euros or Rubles, and not US Dollars (aka: Petrodollar). The FSB notes that Total and Novatek together have a €21 billion ($27 billion) project to develop a LNG project in Yamal in the Russian Arctic that should start producing in 2017. The field’s proven reserves are estimated at around 800 million barrels of oil equivalent, from which the two companies could one day produce as much as 15 million tons a year of LNG. FSB historical addendums to their bulletin note that the Petrodollar system was put into place after President Richard Nixon shocked the global economy on 15 August 1971 when he officially ended the international convertibility from US Dollars into gold, thereby bringing an official end to the Bretton Woods Arrangement that stabilized the global economy in the aftermath of World War II. Two years later, in an effort to maintain global demand for US Dollars, another system was created called the Petrodollar system and in 1973 a deal was struck between Saudi Arabia and the United States in which every barrel of oil purchased from the Saudis would be denominated in US Dollars. Under this new arrangement, any country that sought to purchase oil from Saudi Arabia would be required to first exchange their own national currency for US Dollars. In exchange for Saudi Arabia's willingness to denominate their oil sales exclusively in US Dollars, the US offered weapons and protection of their oil fields from neighboring nations, including Israel. By 1975, all of the OPEC nations had agreed to price their own oil supplies exclusively in US Dollars in exchange for weapons and military protection. 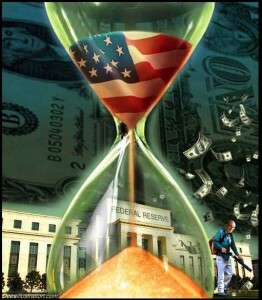 This petrodollar system, or more simply known as an “oil for dollars” system, created an immediate artificial demand for US Dollars around the globe. As global oil demand increased, so did the demand for US Dollars, a scheme that enables America to stay afloat despite being nearly $18 trillion in debt. 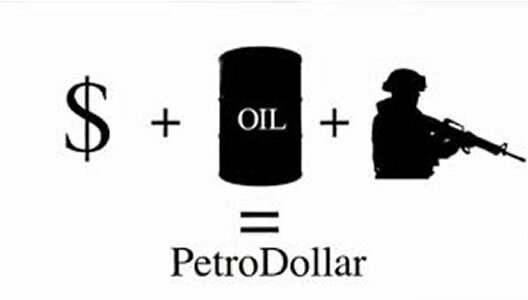 The existence of petrodollars, the FSB notes, is one of the pillars of America’s economic might because it creates a significant external demand for the American currency, allowing the US to accumulate enormous debts without defaulting. With Russia now being demonized and sanctioned by the Obama regime, due to its policy of removing the US Dollar from oil and gas purchases, this FSB bulletin concludes, France has now joined with Iraq, Libya, Syria and Iran in suffering the wrath of daring to go against the Petrodollar…as the assassination of Total CEO Christophe de Margerie proves beyond all doubt the horrific lengths the US will go to in order to protect its rapidly deteriorating economy. October 21, 2014 © EU and US all rights reserved. Permission to use this report in its entirety is granted under the condition it is linked back to its original source at WhatDoesItMean.Com. Freebase content licensed under CC-BY and GFDL.